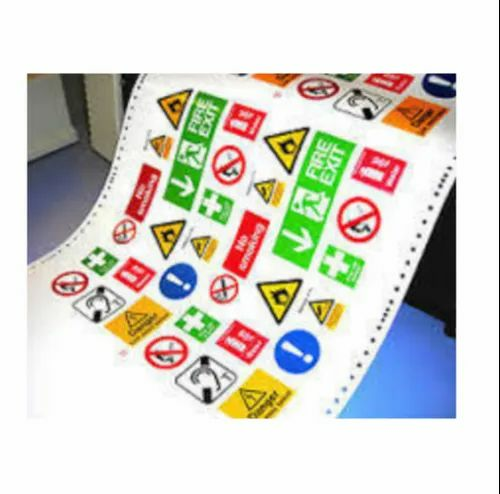 Our customers can get standard qualityPrinted Sticker from us at comprehensive prices. Having long lasting nature, these labels are tested on several parameters by our quality controllers. Silicon paper, face paper and water resistant paper is used to manufacture these labels. These are highly suitable for barcode printers and are made available in roll form. Offered labels are widely used in shipping, processing, garment and various other popular industries. Color: CMYK color or Pantone color printing. Surface disposal: Gloss/matte lamination varnish, hot stamping, UV coating. Since our incorporation is in year 1985, we, “Anograph” are counted as a renowned organizations involved in manufacturing a commendable range of Metal Name Plates & PVC Stickers and Logos. Our product range encompasses of Aluminium Anodised Name Plates, Etched Stainless Steel Name Plates, Brass Copper Name Plates, Metal Labels, Decals Labels and Diamond Cut Logos. In addition to this we also offer Domed Stickers, Forging Logos, Sheet Metal Components, Heat Sinks, Anodised Aluminium Sheets and Anodised Extrusions / Profiles. Our offered range of products are highly applauded in the market for its features like corrosion resistance, durability, robust construction, excellent finish standards, compact design, easy installation, less maintenance, high strength and formability. Based in Thane (Maharashtra), India, since commencement, ours is a sole proprietorship (individual) firm. Known for their extra ordinary features, these products find their application in industries like fans, generators, diesel engine cycles, scooter, cars, and electrical products & for fashion accessories. Besides this, it also caters the needs of UPS / electronic equipment, furniture, home appliances, machineries, automobile industries and lighting devices.